Anderson Manufacturing AR-15 lower parts, oops kit. This item consists of one oops kit. If you own an AR-15 you should have a small pile of AR-15 small parts,and this kit is a good place to start. Springs and Detents can easily get misplaced when you are installing them and/or replacing them. Included in this Oops! kit are the following items: Bolt Catch Detent, Bolt Catch Pin 3/32? x 1/2? 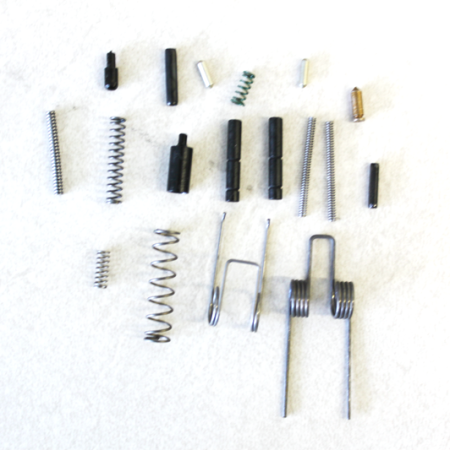 Coiled Pin, Bolt Catch Spring, Buffer Detent, Buffer Detent Spring, Disconnect Spring, Magazine Catch Spring for AR15, Safety Selector Detent for AR15, Safety Selector Spring, Take Down Pivot Pin Detent (2 needed per rifle), Detent Take Down Spring (2 needed per rifle), Hammer Spring mil spec, 1/8 x 5/8 coiled Roll Pin for Trigger Guard, Trigger and Hammer Pin for AR15 (2 needed per rifle) and a Trigger Spring single stage mil-spec. FYI, AR-15 parts, are near impossible to get right now. So, if you have an AR-15 and you dont have any spare parts, the Oops kit, is a must have! These smaller parts, are sometimes the hardest to find.